After many years of neglect, I have finally decided to start clearing out our spare room so we can turn into some kind of usable space. We have a lot of really old computer parts which must’ve belonged to my dad. I’ve tried selling a few bits off on ebay but the problem is that no one really wants retro computer parts. I don’t want to just throw them out so I’m trying to find something to do with them. So far, the only use I’ve got is by making a rather cool keyring out of some old 32Mb SDRAM I found. I took a hacksaw to it to halve the size, filed off the edges and used an existing hole for the ring. I think it looks pretty cool. If anyone wants one, let me know – I have about 20 odd boards of old RAM sitting in a box. If there are any budding local artists who want to take up mixed media sculptures, check out Gabriel Dishaw‘s Darth Vader art made from old computer and typewriter parts (below) or Franco Recchia‘s beautiful cityscapes. I’d love to inspire someone more creative than myself. At 24 years of age, I have finally accepted my inner nerd. It's time to finally tell the world! Electronics student with a love for all things geek and gaming. Grab a cup of tea and let's talk Star Wars. This entry was posted in Geek DIY and tagged Art, Computing, DIY, Geek. Bookmark the permalink. That Darth is AMAZING!! 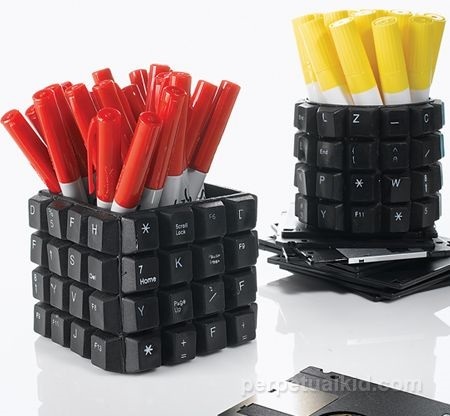 The keyboard pen cups are actually doable. I might try one. These are cool. I like repurposing stuff like this. 🙂 I like the keychain!